It's still early in the high school track and field season. But it started to look and feel more like midseason by the end of the night Wednesday at Scappoose High. 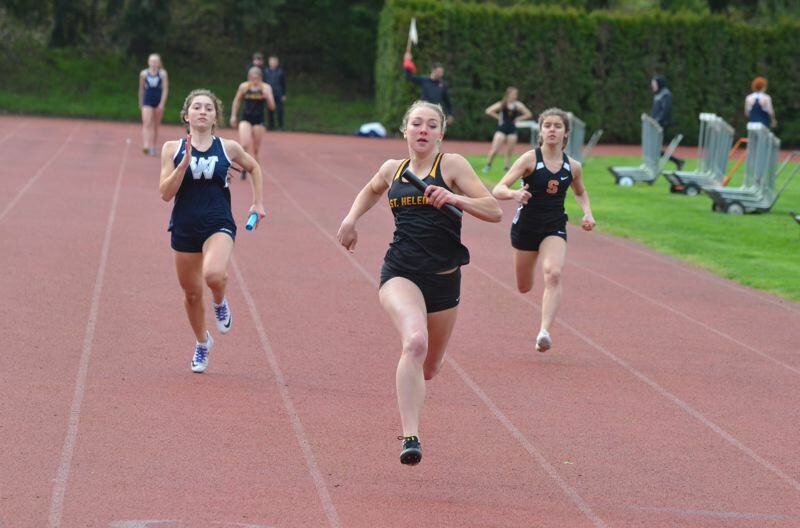 The St. Helens Lions were in town, as were the formidable Wilsonville Wildcats, and the three-way Northwest Oregon Conference meet took on its own significance and bragging rights. Each school had its areas of star power and depth, for boys and girls, and traded off scoring points. And both St. Helens and Scappoose were able to come away with things to feel good about. "We're doing well in the girls running events, and our boys are looking good in the sprints and in the field," St. Helens coach Megan Cox said. "I think we showed we can compete with the best and with the big schools," said Scappoose coach Dennis Olstedt, whose Indians have moved up from Class 4A to 5A this year, to face the likes of Wilsonville and St. Helens now on a regular, counting basis. For boys, Wilsonville totaled 67 points, Scappoose 59 and St. Helens 55. For girls, Wilsonville piled up 96 points to 46 for Scappoose and 39 for St. Helens. Taking Wilsonville out of the equation, head to head, St. Helens edged Scappoose in boys, 74-71, while Scappoose outpointed St. Helens in girls, 84-56. Cox admitted that doing well against Scappoose was a motivating factor for the Lions. "It's always important. It's nice to have that rivalry back," she said. Olstedt said he was happy to see his athletes taking on that challenge, too. "We came into this league thinking, 'Oh, my gosh, we've got so many bigger schools and better competition.' Today our kids really tried their hardest, and it was admirable of them. The whole team was competitive. I'm so proud of them right now. They're supporting each other, and they're really right where they need to be for this season." 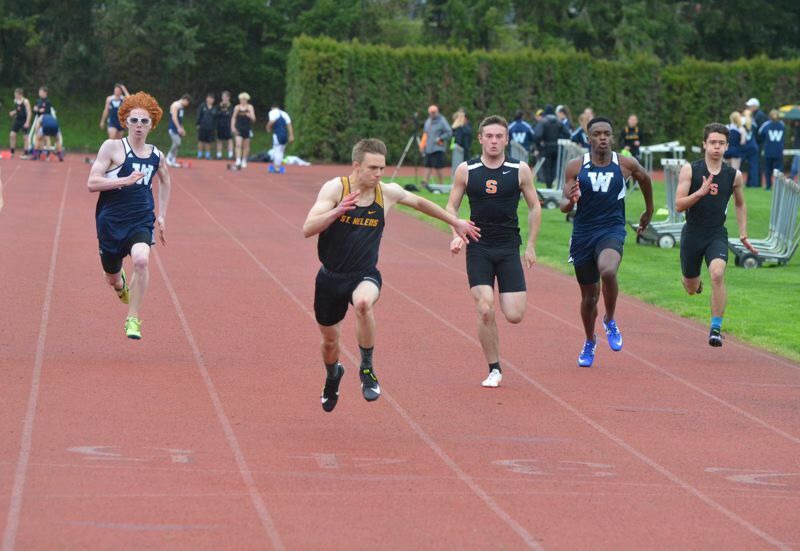 • In the three-way boys competition, Scappoose took first in seven of the 17 events, St. Helens in four. The Indians were second in five events, the Lions second in six. Scappoose swept the two boys relays and got three individual victories from junior Brisyn Maller (110- and 300-meter hurdles and triple jump). Also, freshman Neil Hoffman won the 400 and twin frosh Rowen and Luke Suchoski went 1-2 in the 3,000 in a battle with Wilsonville senior Jack Burns, who was third after winning the 1,500. Rowen Suchoski was first to take the lead in the 3K, and early on Luke moved ahead of Burns to join him and help establish a lead gap. Rowen went on to win in 9:40.00, and Luke's 9:42.70 was more than six seconds ahead of Burns. Both Scappoose runners set PRs, and "we'll improve it, for sure," Luke said. "I never looked behind me the whole time," said Rowen. St. Helens had a double winner in junior sprinter Logan Page (100 PR of 11.20 seconds, 22.79 in the 200). And for the Lions, junior Jeremy O'Meara won the pole vault with a PR clearance of 11 feet, while senior Daniel Suon and junior Gabe Hughes finished 1-2 in the discus, with PRs of 122-9 and 118-6. Page is off to a good start on the track. "I feel like I'm being more smooth in my running, more relaxed," he said. "I'm stronger and building endurance. I'm able to run longer, especially in the 200 and 4x400 (relay)"
• In the girls meet, Scappoose grabbed three firsts, all by junior Emma Jones, and St. Helens took both relays and got a sprint double from sophomore Savannah Moore, along with a 400 win by freshman Hannah Hayduk and a first in the high jump by junior Savannah Hoffman. Jones posted season bests in the 100 and 300 hurdles (16.61, 48.09) and was close to that in the long jump (16-0). Scappoose junior Kelsey Ela took second in both hurdles, also with her best marks of the year (17.91, 53.85). Indians senior Sierra Stafford was the runner-up in the long jump at 14-8 1/4. Other individual seconds for Scappoose came from junior Tess Conway (2019 best 2:27.28 in the 800), freshman Sydney Hanke (PR of 5:21.64 in the 1,500), senior Anne Morud in the 3,000 and junior Ashlen Searle in the discus. Moore was dominant in the 100 and 200. She ran a PR of 12.83, then did 27.35 in the 200. She also anchored the winning 4x100 relay, teaming with Hayduk, junior Isabelle Wallace and sophomore Isabelle Nelson. And then Moore joined Wallace, senior Mackenzie Trainer and anchor Hayduk in perhaps the highlight event of the meet — a spirited, high-level girls 4x400 relay under the lights. It was a stirring battle with Scappoose for four laps, and Hayduk was able to fight off the charge of Jones down the home straightaway, as St. Helens won in 4:18.65 to the 4:18.95 of the Indians (Conway, sophomore Anika Havlik, Hanke and Jones). "That was a big one," Cox said. "The girls wanted to get a good time, and it was a great race to win. It did mean a lot." Trainer said the Lions had been "really looking forward to it because it's against our rival (Scappoose), and they have the closest 4x4 time to us in the league." Hayduk said running the last leg wasn't easy. "I couldn't tell how close (Jones) was, because it was so loud in the corners with people yelling and cheering. I knew she was close. But the 400 is my race." "That was our goal, to beat Scappoose," Moore said. "It was kind of scary to watch, but pretty exciting." And Trainer added that another thing she likes about the Lions' 4x400 foursome is "we all have blonde hair."